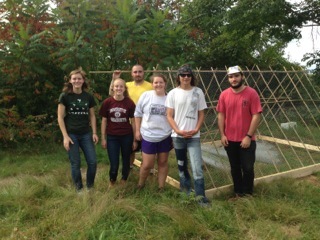 Thanks to Stockbridge Instructor, Nikki Burton, these Sustainable Food and Farming students in the UMass Stockbridge School of Agriculture learned to raise chickens on pasture this past summer at the Agricultural Learning Center. 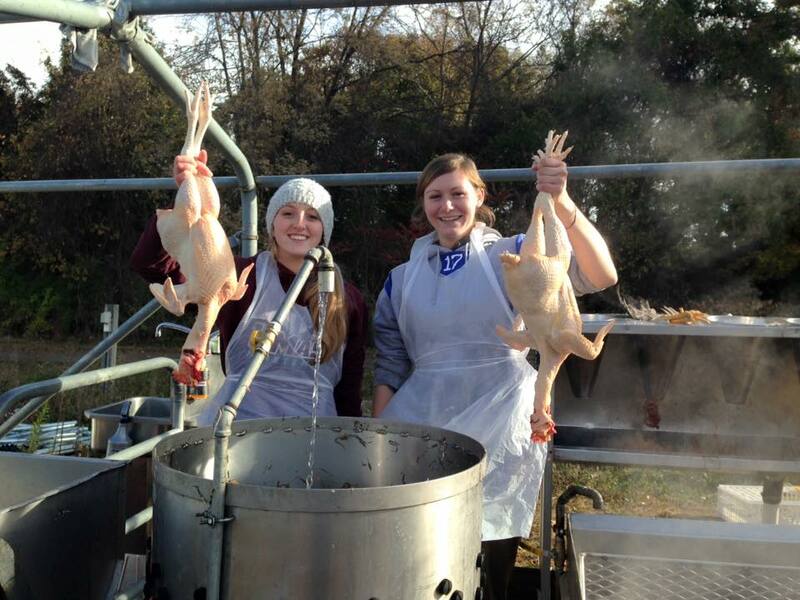 Here are a few pictures from their class…..
A Valley View High School senior hopes to ruffle the feathers of Lackawanna County commissioners over municipal laws against keeping live chickens. 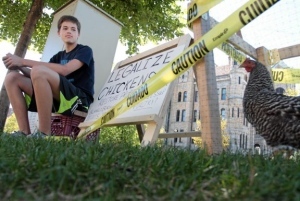 Evan Zavada, 18, spent part of Thursday afternoon on the lawn of courthouse square with a sign reading “Legalize Chickens” propped next to a chicken-wire cage containing a live hen. If Mr. Zavada has his way, municipalities would do away with chicken laws that prohibit or limit how many birds one can own. “I believe it is an infringement upon individual sovereignty and property rights,” said Mr. Zavada, who has 40 chickens. The aim of his pr otest is to gather signatures on a petition he plans to take to the commissioners. He wants them to know he’s serious about a bill he intends to present to them, entitled the “Lackawanna Right to Grow Act,” which would repeal existing municipal ordinances prohibiting the raising of poultry. 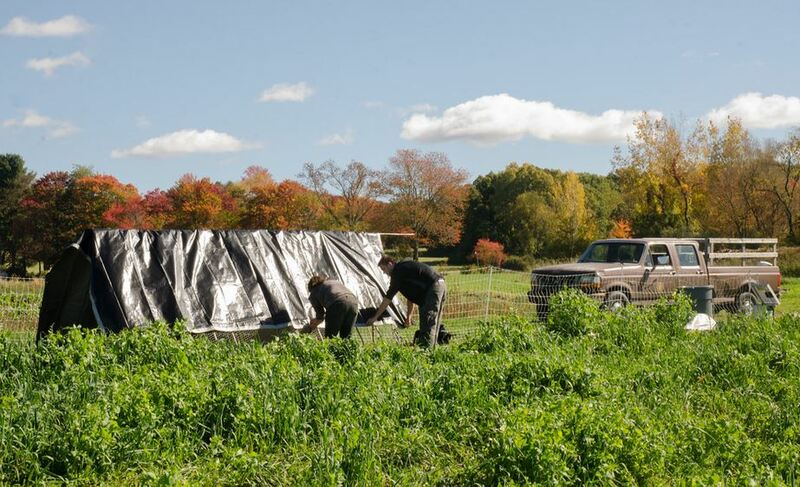 “I don’t see any legitimate reason why we shouldn’t be able to live off the land,” Mr. Zavada said. Lackawanna County Commissioner Corey O’Brien said Mr. Zavada’s petition will be considered and commissioners will talk with borough officials to get all the facts in the case. 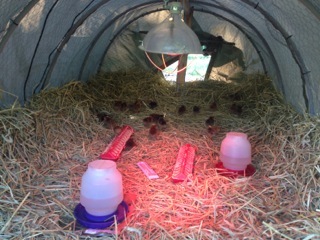 Mr. Zavada said he was inspired by a teacher at Valley View High School several months ago to start raising chickens for their eggs. Mr. Zavada skipped school on Thursday so he could protest. Nine chickens became 40 over the months. He kept them at his grandmother’s four-acre property in Blakely, where he thought they were safe because of the size and relative remoteness of the land. He said he would harvest the eggs and sell them in addition to eating them himself out of an interest in self-dependence. He got into trouble when he let them roam. “One went to some person’s yard and that person complained,” Mr. Zavada said, recalling what prompted Blakely officials to come tell him he could not keep the birds in the borough. The birds are now somewhere in Archbald, which also does not allow chickens. While Mr. Zavada would not say exactly where his 40 chickens are, he did hint that they are no longer free-ranging. Archbald Zoning Officer Scotty Lemoncelli said if he found out a resident was keeping chickens in the borough, he would first issue a warning. If the warning is ignored, the offender will be brought before a magistrate. “It’s not permissible in the borough,” Mr. Lemoncelli said. Efforts to reach Blakely Borough Manager Thomas Wascura were not successful. Other municipalities have enacted similar ordinances that prohibit or restrict certain types of farm animals. In Clarks Summit, for example, pigs, hogs and swine are strictly prohibited, according to a borough ordinance dated July 3, 2001. As for chickens, the ordinance does not expressly restrict poultry, but could make it difficult to keep a chicken in the suburban community. The chicken must be quartered no closer than 10 feet from the exterior of any dwelling or property line and must be kept in an enclosure. 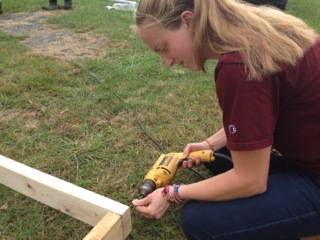 “Most people have been pretty positive about it,” Mr. Zavada said of passers-by on Thursday. He said his parents have been supportive of him, too, but when they learned he skipped school for a chicken protest, his goose may be cooked. 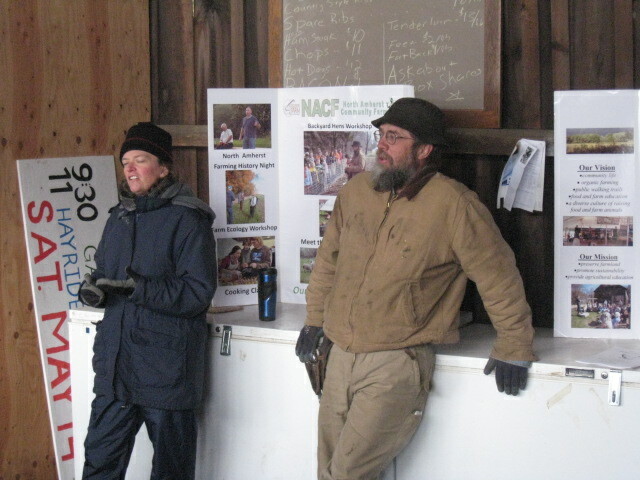 David Tepfer and Katie McDermott shared their experience raising hens including information on getting started, housing, feed and health care, chicken biology and anatomy, harvesting eggs, and protection from predators. 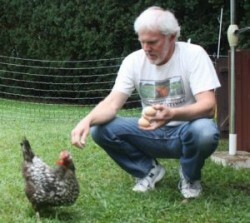 David Tepfer and Katie McDermott will share their experience raising hens. Learn about getting started, housing, feed and health care, chicken biology and anatomy, harvesting eggs, protection from predators, and more. This workshop is designed for beginners! 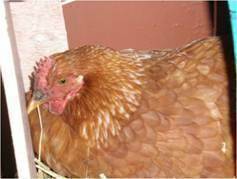 Please join us if you are interested in raising a few hens (for the eggs!). 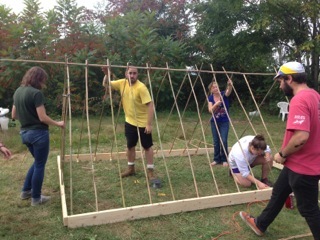 Amherst, MA passes zoning bylaw to allow backyard hens! 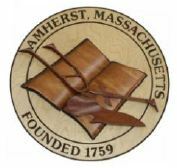 On May 25, 2011 the Amherst Town Meeting overwhelmingly endorsed a citizen’s petition article which makes it easier to raise hens in town legally! 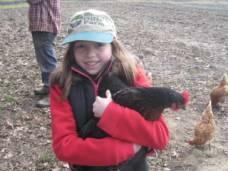 Raising egg-laying hens is a safe, healthy and educational family activity. Hens are quieter, cleaner and easier to care for than dogs. A major barrier for many Amherst residents to raising hens was our town zoning rules which required many residents to go through a burdensome and expensive permitting process. A Citizens Petition Article was proposed to Town Meeting to allow safe and responsible raising of hens and meat rabbits in all non-commercial zoning districts while putting the responsibility for protecting the rights of neighbors and the health of the animals in the hands of the Health Director and the Animal Welfare Officer, rather than the Zoning Board of Appeals. The proposal was to eliminate zoning restrictions against hens and rabbits and allow up to 12 animals by right. Sites where animals are to be raised will be licensed by the Health Department for a minimal fee, homeowners will receive educational materials on the safe care for animals, and sites may be inspected annually by the Animal Welfare Officer. The new zoning bylaw is described here. In addition, changes were made in the Animal Welfare Bylaw to protect the animals and the neighbors. Relevant sections of the new Animal Welfare Bylaw are posted here. ….get involved – it is possible to change the law! We have filed a Citizens Petition article for Spring 2011 Town Meeting which would make it easier to raise backyard hens in Amherst. 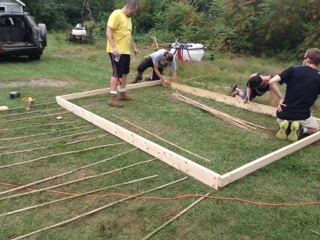 We believe the keeping of backyard animals, particularly hens, is an appropriately-scaled, practical and symbolic form of environmental, fiscal, and community sustainability. 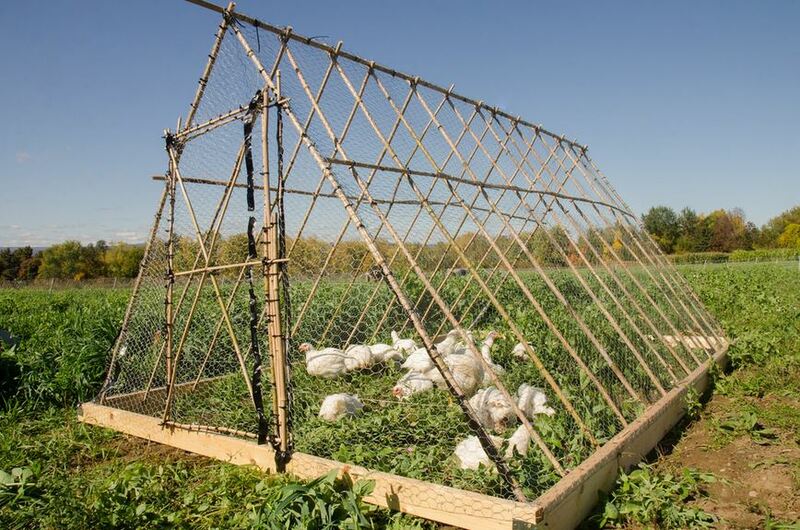 As part of the local food movement, cities and towns across the nation are enacting “hen friendly” legislation to help residents move toward personal, neighborhood and community self-sufficiency. This proposed change in the town bylaw will allow Amherst to join this national movement. A “by right” approach to a small number of animals. Naturally, there are some voices in town who oppose this citizens petition. Some of those concerns have been expressed by the Planning Board Zoning Subcommittee. To hear those concerns, please check out this 6 minute video. Finally, if you want to be kept informed of the progress of this citizens petition article, or when Planning Board meetings will be held, please let me know at: jgerber@psis.umass.edu. The salmonella outbreak has been tracked back to bad management and overcrowded conditions in the egg factories in the Midwest. Not really a big surprise, huh? The nation seems to be waking up to the fact that industrial agriculture can produce cheap food, or it can produce safe food with oversight….. but it can’t produce cheap and safe food. We need to pay for good quality, safe food. But my experience suggest that backyard hens can produce cheap and safe eggs! Today’s NY Times reviews the situation. Check it out! Its not just the chickens that are sick…. stop antibiotic use in factory farms! Antibiotics fed routinely to livestock in their food and water can promote faster growth, but the practice is also used as a way to compensate for the effects of extreme overcrowding and unsanitary conditions in factory farms. This practice is dangerous to humans as it serves as a petri dish which selects for antibiotic resistant bacteria. Johns Hopkins researcher, Kellogg Schwab, says he’s more than just concerned: “This development of drug resistance scares the hell out of me. If we continue on and we lose the ability to fight these microorganisms, a robust, healthy individual has a chance of dying, where before we would be able to prevent that death.” Schwab says that if he tried, he could not build a better incubator of resistant pathogens than a factory farm. The American Medical Association has called for a ban on this practice, and the FDA is considering new guidelines, but they are non-binding and not adequate to protect human health. To see a full report from John Hopkins, click here or on the picture below. The FDA is accepting public comments on their draft guidlines until August 28 (Saturday). Will you join me and tell them it’s time to enact real regulations that protect public health and ensure responsible use of antibiotics in animals? A web based (simple) means of sending them comments is available here. Or write your own! How do we respond to the egg recall? While the recall of a half billion eggs seems to be impacting the Midwest and South direclty, we all should be thinking about the reason that food is making people sick. A recent article in the Huffington Post traces the root cause of the problem to the industrial food system and the nature of factory farms. I agree – and here is why. And here is a graph depicting the relative number of salmonella cases in different hen raising systems. Big factory farms use battery cages. It is difficult to know how to respond however, when almost all of the eggs we see in our supermarkets are from big factory farms using battery cages. But….. WE DO HAVE CHOICES! Today’s press reported several stories about how the egg recall was stimulating interest in local eggs (mostly free-range). But you need to make sure your “local” eggs are really grown locally – not just repacked with a local label. 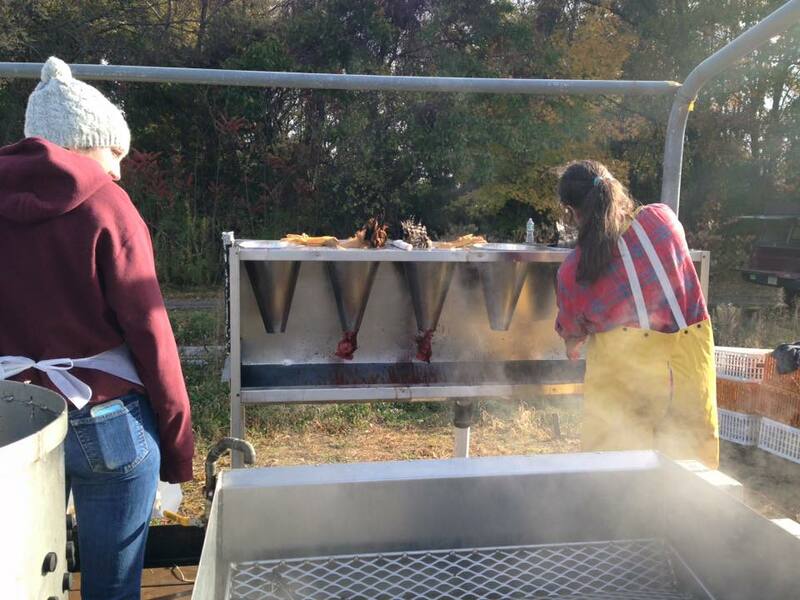 To find a local egg producer in Western Massachusetts check the CISA website. Lots of local hens! 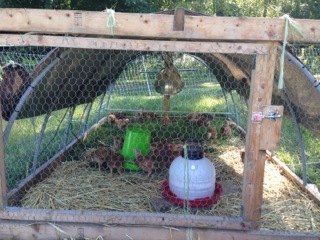 Or even better…..
Backyard hens……. one of the reasons we don’t see more hens in the towns and cities of Western Massachusetts is the local zoning ordinances. But that is changing! For more on zoning laws in one town and on raising hens in general, click here. 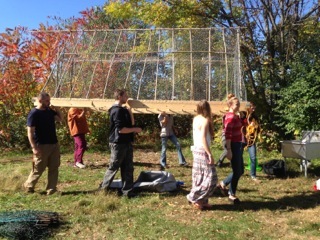 And finally, click here to join a listserve of “backyard chicken folks” – there are lots of us in Western Massachusetts! Join us!